FILE - An aerial view shows the city skyline of Shenyang, Liaoning province, China, Oct. 18, 2015. Cranes dot the skyline of China's northeastern city of Shenyang. And from the street level, the slowing growth of the Chinese economy seems like a mirage in this rust-belt city. Shenyang's main street, Qingnian Dajie, or Youth Avenue, which also is known as the "Golden Corridor," is lined with massive shopping malls and high-end outlets carrying everything from Louis Vuitton to Prada. There's even a Ferrari dealership. Beyond the facade of a city that is building all the trappings of a modern metropolis, though, is a different story. Slowing growth has hit hard China's industrial heartland in the northeast. For years, the region was seen as the engine of China's economy. The area is rich in natural resources and has long been an industrial base for the rest of the country. Not long ago, it was contributing about 10 percent to the country's growth. 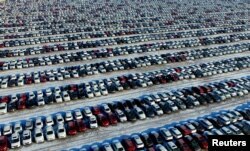 New cars are seen at a parking lot in Shenyang, Liaoning province, China, Jan. 16, 2017. Now, that engine is stalling. Shenyang is the capital of Liaoning, the only Chinese province to slip into a recession last year. And how bad things really are is anyone's guess. Liaoning's governor, Chen Qiufa, admitted last year that from 2011 to 2014, city and local governments in the province had been systematically inflating their growth figures. The Chinese Communist Party-backed People's Daily even reported that by 2014, some local governments inflated figures by as much as 23 percent. Despite that, streets like Youth Avenue are lined with massive projects. There is a towering 568-meter building under construction, as well as a sprawling W Hotel and shopping complex, even as others only blocks away remain empty. Nor does one need to look far to find advertisements for office space. Around 40 percent of the city's commercial space is unoccupied. Chinese officials are clearly concerned about the region, and the northeast is expected to be a key topic during the "Twin Sessions," top-level political meetings that begin Friday and include China's rubber-stamp legislature, the National People's Congress, and a top political advisory body, the Chinese People's Political Consultative Conference, or CPPCC. 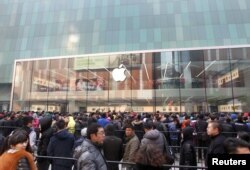 FILE - Customers wait for the opening of an Apple store in Shenyang, Liaoning province, Feb. 28, 2015. Spokesman Wang Guoqing of the CPPCC highlighted the importance of the northeast at a pre-meeting news conference. "Looking at our work over the past year, there are many tough tasks that remain regarding rejuvenating the northeast," Wang said. "To rejuvenate the northeast, we not only need strong policy support, but also solid faith." However, it's unclear what kind of policy solutions officials might offer up during the meetings. Restructuring the region's debt-burdened state-owned enterprises is one big challenge. Keeping younger residents in places like Shenyang, who can help grow and drive the economy, is another, said Sabrina Wei, head of North China research for real estate services firm Cushman and Wakefield. "Infrastructure creates some jobs, but how long will it last? It could help northeast China maintain its GDP growth for maybe two or three years," Wei said, "but after that, how to stimulate the economy — that's another question." The central government seems set on a continued program of throwing money and projects in the northeast's direction. It has earmarked billions of dollars to support that effort and listed some 130 projects. FILE - Investors look at computer screens showing stock information at a brokerage house in Shenyang, Liaoning province, April 13, 2015. For those whom VOA spoke with on the streets in Shenyang, who have forged their careers around this transforming city for better or worse, uncertainty is a big challenge. One resident, surnamed Yang, who owns a small shop selling IT goods, said retailers like those here are not just dealing with a slowing economy. "Times are tough now for those in the IT industry," she said. "Amid the economic slowdown, profit margins are tighter, sales are on the wane, and then there's the impact of online sales." Another longtime Shenyang resident surnamed Li, who works in the finance sector, said big money was drying up. "Working in the financial sector is not as vibrant as it used to be, and the sector isn't as prosperous as it used to be," Li said. "Personal loans are still easy to come by, but business in the financial sector is not good and overall prospects have worsened." But some areas — such as tourism — have room for growth, according to one man surnamed Zhang. He said that while many residents in Shenyang easily travel on their own to Japan and South Korea, there is growing demand to visit Southeast Asia. "I've worked all kinds of sales jobs, sold phones, real estate," Zhang said. "That helped me get to know a lot of people, and is why I've switched over to work in the travel industry." FILE - People select vegetables at a open-air morning market in Shenyang, Liaoning province, April 10, 2015. Keeping residents in Shenyang is difficult, and many that we spoke with say they worked at one time or another in other parts of the country. Shenyang and many cities in the northeast struggle to keep college graduates at home because many find jobs and opportunities in places like Beijing, Shanghai and other coastal cities more attractive. And as the population of northeastern residents shrinks and talent flows elsewhere, some joke that everywhere you go there are people from dongbei, the Chinese word for northeast, to be found. But that's not good for the local economy. "If you lose people and there are only older people there, there is no hope," said Cushman and Wakefield's Wei. She said that finding a way to get people to stay, find good jobs and contribute to the local economy is a big challenge, and an important one.